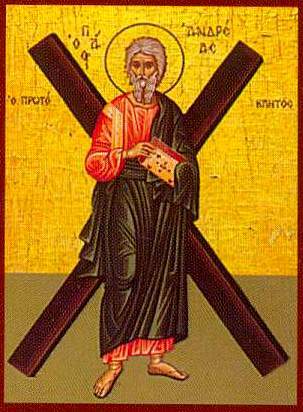 St. Andrew, Apostle of Jesus Christ, lived and died, “…all the way to the last catch of fish”. Andrew, alive in Christ, caught by Him, the great Fisherman, lived all the way to the end. In Christ, Andrew knew by faith, the end was the beginning. The cross was a door because of the One who died on it and off the cross, three days later, rose from the dead. Lord I wanna go to heaven but I don’t wanna die/So I long for the day when I’ll have new birth still I love the livin’ here on earth (Loretta Lynn). I think this may be true for us all, I still love the livin’ here on earth…but it leaves me thinking that this is not necessarily meet, right nor salutary. The Lord knows my “resume”. He knows Paul’s and Andew’s and Lou’s and mine and your resumes as well. Christ came to rewrite our resumes in His blood for our repentance…our joyful repentance…to ventilate our lives with His holiness, by faith through grace. He started to do this when He was conceived in the Virgin’s womb, amniotic fluid and blood to bear our sin and death and fear. Life is not generic but has a Name: for to me to live is Christ, and to die is gain. If my livin’ is only my name, then I am lost forever. We die many times before our physical death, spiritual death, repeated because of Baptism in the sacrament of penitence. Contrary to Miss Lynn, we have the new birth. Christ is specific, not generic spirituality: His Body, His Blood, is life, eternal life (John 6). In Advent, this is the actual message of the angels, not the gifts under the tree, but the Tree by which is given the gifts of heaven.